In 1993, the General Assembly adopted the Hertford County Watermelon Festival as the official Northeastern North Carolina Watermelon Festival (Session Laws, 1993, c. 212). In 1993, the General Assembly also designated the Fair Bluff Watermelon Festival as the official Southeastern North Carolina Watermelon Festival (Session Laws, 1993, c. 212). The Hertford County Watermelon Festival (also called the North Carolina Watermelon Festival,) began in 1985 and takes place in the town of Murfreesboro, North Carolina. Events held include a parade, a 5K race, a festival market with food and craft vendors, entertainment from local bands, amusement rides, and Little Farmers/Princess beauty pagents. The Fair Bluff Watermelon Festival (also called the North Carolina Watermelon Festival) officially started in 1986, but can trace its roots back to a simple competition between friends in 1979. Monroe Enzor and AJ Worley were semi-retired best friends who, as a hobby, began competing to see who could grow the largest watermelon. In the summer they would truck their prized watermelons into town to weigh them, and every year the crowd watching the weighing would grow. Seeing that there was an interest, the two men started the Fair Bluff Watermelon Grower's Association and created a festival around the competition. Both Enzor and Worley died in 1991, but the festival continues to this day with arts and crafts, festival beauty pagents, a dance, a parade, a duck race, and other assorted games and contests. AN ACT TO ADOPT THE HERTFORD COUNTY WATERMELON FESTIVAL AND THE FAIR BLUFF WATERMELON FESTIVAL AS THE OFFICIAL NORTH CAROLINA WATERMELON FESTIVALS. "§ 145-16. State Watermelon Festivals. 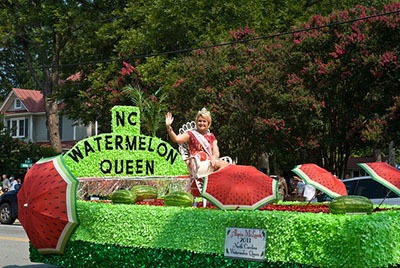 (a) The Hertford County Watermelon Festival is adopted as the official Northeastern North Carolina Watermelon Festival. The Hertford County Watermelon Festival shall be observed annually during the last four days of the first week in August. (b) The Fair Bluff Watermelon Festival in Columbus County is adopted as the official Southeastern North Carolina Watermelon Festival. The Fair Bluff Watermelon Festival shall be observed annually during mid-July. In the General Assembly read three times and ratified this the 24th day of June, 1993.